Assessments of population size are of prime importance in understanding a species' ecology and critical in relation to the conservation of threatened species. Traditional methods of estimating the population size of frogs can be laborious, capturing individual animals, marking and recapturing (CR) and rely on a series of assumptions when building models which are often violated (Efford et al, 2009). However, if done well, CR estimates of frog populations are the corner-stone of determining population health (Marsh, 2001) and are therefore of great importance when working with threatened species (Stuart et al, 2004). An alternative to capturing and marking frogs is to estimate numbers of calling males, and this technique has been traditionally used to gather qualitative or categorical information on frog abundance (assuming that calling males and non-calling females are in equal numbers). While males calling at any one time might not represent the entire population, the numbers have been found to correlate when combined with CR estimates of the same populations (Grafe & Meuche, 2005). In addition, male chorus tenure is the best known determinant of mating success in many frog species (Halliday & Tejedo, 1995; Dyson et al, 1998). Advances in CR methodologies and analyses have meant that these models provide reliable quantitative estimates of population parameters. At the moment, studies using calls have the advantage that they are non-invasive, but are rarely quantitative and include a substantial amount of observer bias. This methodology shows that it is practical to obtain quantitative data using non-invasive recordings of frog calls from a microphone array to estimate population parameters using CR methods. The MeaseyLab are developing this novel acoustic survey technique to estimate the density of threatened Fynbos frogs (genus Arthroleptella) from South Africa's remote mountain seepages where current monitoring techniques only provide qualitative data. 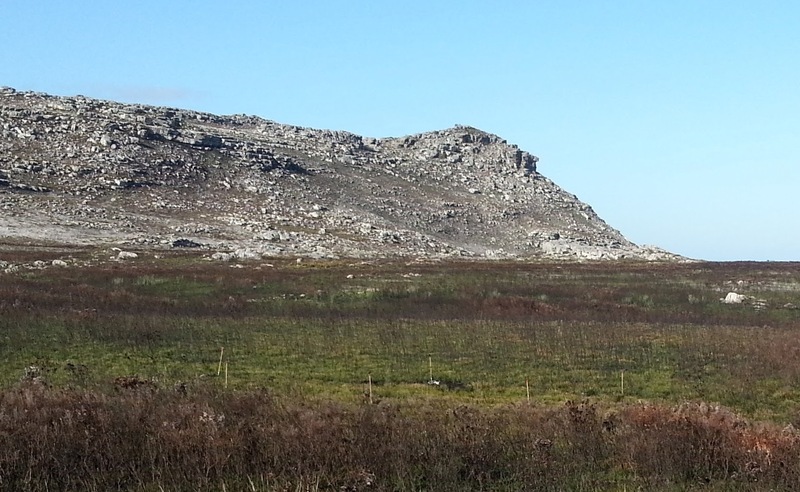 In the image above, an array of six microphones is deployed in a montane area of the Cape peninsula. Note the recorder at the base of the third pole from the right. This methodology has been described by Borchers (2012) and Borchers et al (2015) and so a full explanation won't be repeated here. The method grew out of using the spatial (position) data that described the placement of traps as this provides information both about where the animals are captured, as well as where they aren't captured. The result of the statistical analysis of SCR data provides a spatial location for the centroid of the animal's range (as a probability density function), and a statistical estimate of the effective trapping area. Together with an estimate of the number of animals, the trapping area allows SCR to give an estimate of animal density from CR data, simply by adding the spatial component. Spatial data is routinely captured with CR data, such that it may be possible to re-analyse a great deal of existing CR data to give much greater spatial insight through SCR. It turns out, however, that the capture of the animals doesn't have to be sequential (as you might have with trapping occasions with CR data). Instead, captures and recaptures can be simultaneous. This means that sounds, captured by one or more of an array of microphones can be analysed with SCR. The advantages that SCR brings normal CR data remain, such that locations of sounds can be determined, and a statistical estimation of the detection area of the microphone array can be made. However, here we refer to aSCR as a combination of methods including SCR and other data that are inherent to recordings of animal calls. In addition to adapting existing SCR methods for use with acoustic data, the method is extended to use the differences in the time-of-arrival (ToA) of detections at different microphones to improve inference about the location of the frogs making the detected sounds. The statistical methods were further extended to accommodate signal strength (SS) data as well as the ToA data. Inclusion of such data was found to substantially improve inferences (and in particular to reduce uncertainty) about frog density from such acoustic survey data (Stevenson et al 2015). In the image (left) you can see how a call heard on three microphones creates a probability density function using SCR methodology (blue circles). The combination of SS and ToA data provides another probability density function (green circles) that better define the area where the call was heard. Lastly, adding these three functions together (SCR + SS + ToA: black circles), you obtain a probability density function with surprising accuracy. In the other image (right) a c all heard on all six microphones gives little information from SCR, but adding in SS and ToA allows the location of the call to be tightly defined. Using SCR methods with ToA data from surveys in the field, we detected calls up to 1.259 calls per m2 per minute. Using an estimated call rate of 0.266 calls per second (± 0.0067 SE), this translates into an estimate of 7 A. lightfooti per metre squared. So is aSCR different from sound triangulation? Yes, while both methods make use of the spatial delay in the sound reaching the microphones, aSCR is able to get a tighter estimate of the probable location as it is using data from SCR and SS as well. But, more importantly, aSCR is able to statistically estimation of the detection area of the microphone array. This means that aSCR methods can provide an estimate of call density, or if call rate is known, an estimate of animal density. Why is the detection area important in aSCR? After running a number of trials under seemingly different conditions we have found a considerable difference in the estimated detection area. That is, the microphones detect different distances on different occasions. This is perhaps not surprising as one can imagine that only a small breeze is enough to change detection rates of the farthest frogs. However, no other methods are making any estimate of detection area which means that they are unable to monitor the inherent changes in acoustic conditions. Effectively, this makes other acoustic methods non-repeatable as each recording occasion is representing an unknown and changing area. Why is aSCR useful for monitoring? The aSCR method can be used to monitor the density of calls in a site over time. Managers are increasingly using calls to monitor sensitive species because the collection of data is non-invasive, and due to the advances in automated digital recording technology which makes it relatively easy to monitor even remote sites. We have used aSCR at the same sites over a single season to monitor the changes in frog calling density at a remote site in South Africa (Measey et al 2016). This study shows the practicality of the method, but also how reliable density data can be incorporated with climatic variables to provide answers to specific ecological questions. In theory, the aSCR methodology can be used for any calling animals. There is a massive potential to install acoustic arrays in sensitive areas to monitor the soundscape. Try our "getting started" page to take you to the next level of acoustic monitoring. Borchers, D. (2012) A non-technical overview of spatially explicit capture–recapture models. Journal of Ornithology,152, 435-444. Borchers, D., Stevenson, B., Kidney, D., Thomas, L. & Marques, T. (2015) A unifying model for capture–recapture and distance sampling surveys of wildlife populations. Journal of the American Statistical Association,110, 195-204. Dyson, M. L., Henzi, S. P., Halliday, T. R. & Barrett, L. (1998) Success breeds success in mating male reed frogs (Hyperolius marmoratus). Proceedings of the Royal Society of London Series B, 265, 1417-1421. Efford, M. G., Dawson, D. K. & Borchers, D. L. (2009) Population density estimated from locations of individuals on a passive detector array. Ecology, 90, 2676-2682. Grafe, T. U. & Meuche, I. (2005) Estimate of chorus tenure and population size of male European treefrogs Hyla arborea: implications for conservation. Amphibia-Reptilia, 26, 437-444. Halliday, T. & Tejedo, M. (1995) Intrasexual selection and alternative mating behaviour. Amphibian biology: social behaviour (eds. H. Heatwole & B. K. Sullivan), pp. 419-468. Surrey Beatty & Sons, Chipping Norton, NSW. Marsh, D. M. (2001) Fluctuations in amphibian populations: a meta-analysis. Biological Conservation, 101, 327-335. Stuart, S. N., Chanson, J. S., Cox, N. A., Young, B. E., Rodrigues, A. S. L., Fischman, D. L. & Waller, R. W. (2004) Status and trends of amphibian declines and extinctions worldwide. Science, 306, 1783-1786. Our own Marike Louw exhibited her poster on aSCR at the Ecology Across Borders meeting. Note that only calls from the frog are recognised. Other calls from birds and noises from insects are the wind are ignored. This process occurs in the call recognition process in PAMGuard. Note also that the fewer microphones that hear the frog noise (red rings around the microphone crosses), the less accurate are the probability functions that suggest where the frog might be.